“Do hair transplants hurt?” It’s one of the most common questions we receive and one of the biggest concerns prospective patients have when they come to RHRLI. 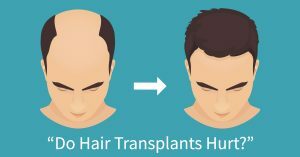 If you’re looking for a permanent solution to hair loss or thinning hair you’ve probably heard about different types of hair transplant procedures and maybe wondering what might be right for you. At RHRLI we are the only hair treatment center on Long Island that offers the ARTAS® Robotic Hair Transplant System. It uses Robotic technology to give you a full, healthy head of hair. One of the biggest benefits of the ARTAS® System is that it’s minimally invasive. We know that pain issues factor greatly in your decision to seek treatment for hair loss. So we want to let you know how ARTAS® compares to other procedures and give you information about what you need to know about pain and hair transplants. The ARTAS® system is a Follicular Unit Extraction (FUE) procedure. FUE or Robotic Follicular Unit Extraction (RFUE) differs greatly from another procedure known as Follicular Unit Transplantation (FUT), which is also known as strip surgery. As we mentioned, FUE is minimally invasive and does not require surgical incisions or use of stitches. In fact, some patients don’t even need any pain medication after the procedure is finished. The ARTAS® procedure involves harvesting donor hairs from the back and sides of the head and our doctor, Baiju C. Gohil, uses robotic technology to transplant hair to where it’s needed. The procedure is done with no linear scar visible. Once the procedure is over, most patients return to work or regular activity in just a few days. Follicular Unit Transplantation (FUT) is a surgical procedure which involves harvesting hair from strips of skin removed from the scalp. This means that stitches will be required as the donor area will be sutured closed. There is likely to be scarring as a result of the strip surgery and a linear scar can be visible for patients who wear shorter hairstyles. Other symptoms that may occur include tingling, numbness, and tightness of scalp. Many patients require pain medication following an FUT procedure and your activity could be restricted for a few weeks. There’s very little patients have to worry about in terms of pain in the days and weeks after they undergo the ARTAS® procedure. According to the ARTAS® website, patients who feel any discomfort can usually have it controlled by non-aspirin pain relievers like acetaminophen. Mild shampoo like baby shampoo is recommended for the first day after the procedure and patients are told not to manipulate the transplant areas during shampooing for three days following the procedure. Normal shampooing can resume in a week. At RHRLI, we’ve recently asked a group of patients to rate the amount of pain they felt connected to the ARTAS® procedure on a scale from 1 to 10 with 10 being the most painful. All of the group rated the pain threshold at 3 or under. RHRLI knows that the ARTAS® system can give you the healthiest permanent solution to hair loss out there, and we know that our patients are assured that the procedure is virtually pain-free. Check out our patient testimonial video about their pain experience. To learn more, contact RHRLI today.